Las Vegas-based business duo Christopher Nelson and Tamara Leuty created patented designer handbags with built-in lights that enable you to see what’s inside. Then they started a business — Glass Handbag — in late 2010. They received U.S. and international patents for their invention. They found suitable designers and suppliers. And they launched an attractive ecommerce site to sell their products. The bad news is that the partners have spent $500,000 on it all and have sold just 100 handbags, for roughly $15,000 in revenue. It’s an expensive lesson, in other words. But fortunately for us, they’ve agreed to share their experiences. And, admirably, they aren’t giving up. Christopher Nelson and Tamara Leuty. Despite his experience in knowing that new products are difficult to market, Nelson says their lessons in creating and marketing their unique handbag have been expensive ones. In 2010 Leuty began to invent a handbag with an integrated light system, which she said people have been trying to create since the 1950s. But she persevered. She created designs, found suppliers, and got a prototype in 2011. She sold the first Glass Handbag product in December 2011. In 2012 Glass Handbag was granted an international patent from WIPO — World Intellectual Property Organization — and it is about to receive the U.S. patent, which has been published but which is not yet official. 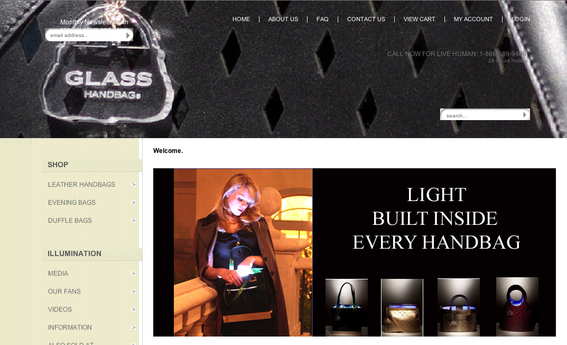 The company launched GlassHandbag.com in June 2011 with Volusion, the hosted shopping cart. Nelson is pleased with Volusion’s all-inclusive model. For his payment gateway, Nelson uses Authorize.Net because it is compatible with Volusion. But he is no fan of credit card processing companies generally, beyond payment gateways. Glass Handbag offers payment via PayPal, MasterCard, Visa, and Discover. It added Square in July 2012 so buyers can purchase the handbags on their mobile phones. Nelson said Glass Handbag has tried Volusion’s search engine optimization service and, also, the services of Orange Soda, a consulting firm. But has had minimal luck to date. Leuty and Nelson send Glass Handbag’s products via USPS and FedEx. Glass Handbag uses the online version of QuickBooks, which Nelson said is helpful, versus the installed software version. Glass Handbag appears on Google+, Facebook, Twitter, YouTube, LinkedIn, and Pinterest. Nelson uses HootSuite — the social-media management platform — for Twitter and Facebook, posting twice weekly, and promoting the company and handbag sales in only about 20 to 40 percent of the posts. Nelson said he and Leuty don’t have much customer service experience yet as their product has not taken off. But when it does, he will utilize an outsourced order fulfillment facility. 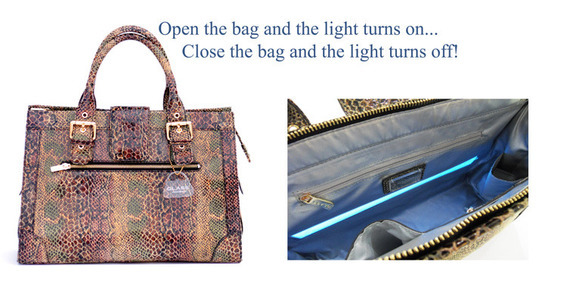 Glass Handbag has patents for the function of their handbag lights. Print advertising has proved equally disappointing. The pair received photo coverage with celebrities from the television show Dancing with the Stars. But Nelson believes this wasn’t worth the $5,000 fee for celebrity photos. Finally, they also regretted getting a bricks-and-mortar showroom in Las Vegas too soon. Since then, the pair have concentrated their efforts and resources on getting traffic to the website. Nelson cites five big successes for Glass Handbag. The first was that the unique designer handbags. Nelson and Leuty appeared on a three-minute segment on nationwide television show, Better TV. Secondly, they were featured for 2 to 3 minutes with the local Fox news television show. However, the biggest success of all is their recent contract with CBS for its daily game show, The Price Is Right, allowing the product on air for up to 2 times per month for a 12 month period.